(2017). Synthesis and morphology characterization of SnO2 nanoparticles by hydrothermal method. International Journal of Bio-Inorganic Hybrid Nanomaterials, 6(1), 29-32.
. "Synthesis and morphology characterization of SnO2 nanoparticles by hydrothermal method". International Journal of Bio-Inorganic Hybrid Nanomaterials, 6, 1, 2017, 29-32. (2017). 'Synthesis and morphology characterization of SnO2 nanoparticles by hydrothermal method', International Journal of Bio-Inorganic Hybrid Nanomaterials, 6(1), pp. 29-32. Synthesis and morphology characterization of SnO2 nanoparticles by hydrothermal method. 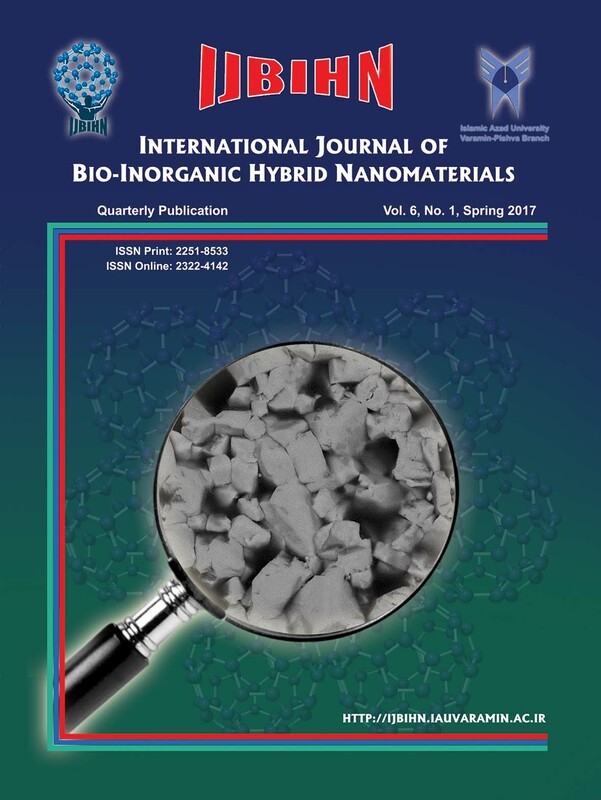 International Journal of Bio-Inorganic Hybrid Nanomaterials, 2017; 6(1): 29-32. Nanoparticles are widely used in different applications such as cancer cell treatment and antibacterial agents. SnO2 nanoparticles were synthesized successfully by hydrothermal method and subsequent calcination using Tin (II) chloride- dihydrate, Sodium hydroxide, in presence of Hexadecyltrimethylammoniumn bromide (CTAB) as Surfactant. These nanoparticles were characterized by using Fourier transform infrared spectroscopy (FTIR), X-ray diffraction (XRD) and scanning electron microscopy (SEM). XRD pattern showed that all diffraction peaks were assigned to the pure tetragonal phase of SnO2 and SEM image of pure SnO2 showed that the nanoparticles are homogeneous with uniform particle size. In this research SnO2 nanoparticles were successfully synthesized.